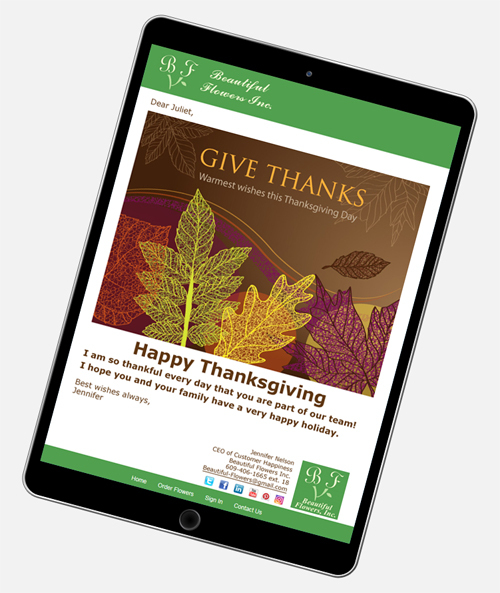 Whether your company has fall events or sales, or you're looking for a thoughtful way to connect with your employees and customers, online Thanksgiving greeting cards are easy, thoughtful and effective! 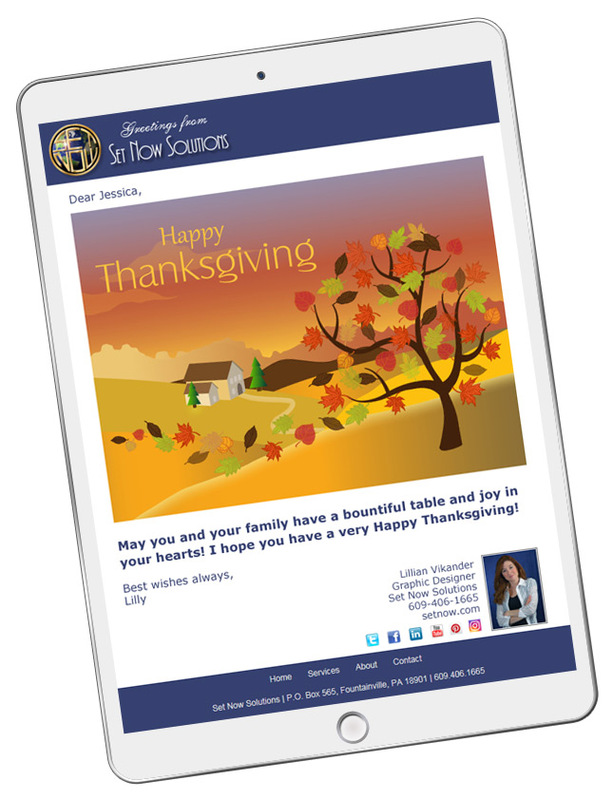 While many businesses send year-end Season's Greetings, some overlook the opportunity to send Thanksgiving cards. This is the perfect time to reflect on what your business is thankful about and connect with those people that make your company successful. CorpNote eCards, Invitations and Surveys can be used in many ways to help you enhance your company branding and strengthen your business relationships. 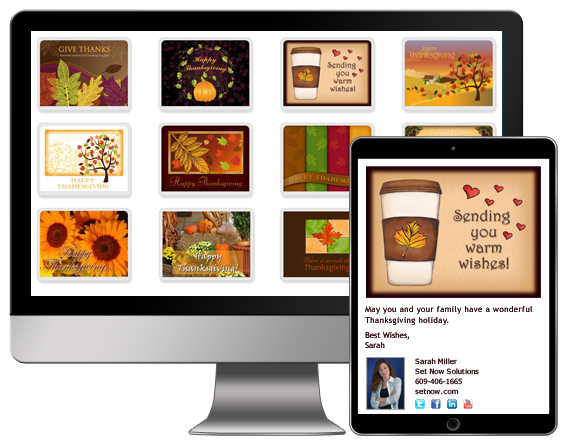 Send a fall message as an eCard that looks great on both mobile & desktop. Post your Thanksgiving eCard in social media. Invite people to fall events or encourage them to take a year-end survey. Send as many online greeting cards as you want for a fixed monthly price. 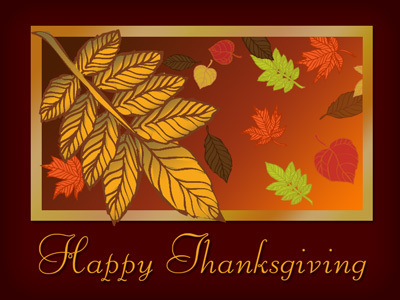 If your business offers a product or service, use a Thanksgiving eCard to promote a fall sales event. You can include a coupon or special offer, exclusive to your eCard recipients, by adding your message to the eCard text or by uploading your own picture. Thanksgiving is the perfect opportunity for businesses that want to express thanks to employees and clients. CorpNote offers a wide selection of eCard designs, specifically created for business. Many organizations have community outreach programs, like food drives and clothing drops. With winter right around the corner, Thanksgiving is the perfect time to organize such an event. Extend the relationship throughout the holiday season – One of the toughest parts of any email or mail campaign is creating your mailing list. By using CorpNote's flexible online address book, once you create your email list and send your eCards, it is extremely easy to MAINTAIN that electronic relationship with your coworkers, acquaintances and customers. You'll be all set to send your online Season's Greetings eCards and New Year's cards... you can even design them in advance and schedule them to be automatically sent for a stress-free holiday season! Birthdays, anniversaries and more – In addition to sending Thanksgiving cards, you'll find MANY WAYS to use CorpNote throughout the year for many other business occasions like birthdays, anniversaries, invitations and news announcements, so you can stay in touch well beyond the holiday season. a complete contact solution that lets you manage employee and client contacts, and helps you comply with commerce rules and regulations, like GDPR and the U.S. CANN-SPAM Act. Are you looking for a way to allow select employees in your company to send their own holiday eCards? CorpNote's Multi-user Membership lets you give key employees in your company their own company-branded account that they can use to send eCards, invitations and surveys to their contacts. Our Multi-user Memberships have the benefit of reduced cost-per-user pricing. When you join CorpNote as a Multi-user member, one person in your company becomes the 'Plan Administrator'. As the plan administrator, you can customize the entire CorpNote website to match your organization's branding, and create eCard templates, which can be shared with selected employees to help ensure brand consistency. You can then create a CorpNote account for people in your company that want to send Thanksgiving or other holiday eCards to their own list of contacts. If your employees' accounts are not needed all year 'round, then you can de-activate their accounts at any time, so you're only paying while the accounts are needed. Companies that have different brands or products, that want to personalize their holiday cards for those divisions. Marketing or communications managers that want to offer affordable eCard, online invitation and online survey tools year-round to their management team, but need to meet certain brand or message guidelines. Learn more about customizing the CorpNote interface to match your company branding.